It seems to be a fact that the Spanish can turn anything into a fiesta. You might have thought that burying rotten fish would not be one of them, but, oh, how wrong would you be! 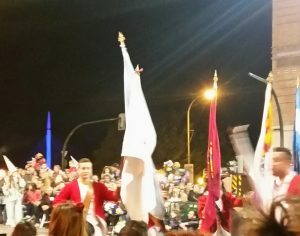 The festival, due to begin at 9 pm, suffered from normal Spanish tardiness, but there was plenty to watch as Sardine Groups gathered in their colourful robes, accompanied frequently by live music or disco tracks. Eventually, one hour later than scheduled, the parade began. It is hard to describe the atmosphere that accompanied the dancers, stilt-walkers, fire-breathers, acrobats, musicians and costumes. The floats were creative, colourful and spectacular, frequently lit up by fireworks, and often spewing smoke or confetti from cannons. Bags were given out to children early on to collect sweets and toys given out as floats passed. A local tv station recorded the parade. 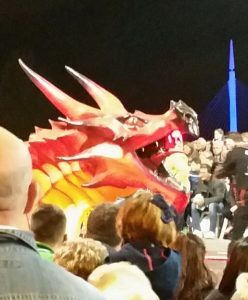 The highlights included a tribute to Spanish football, an unexpected and delightful Star Wars themed float surrounded by characters from all seven films, and a Harry Potteresque giant sorcerer. There were bands aplenty, playing everything from Salsa, to jazz, to pop, to classics. Dancers accompanied the musicians, and thankfully it was a warm night as the female performers were often underdressed! The costumes were spectacular, displaying the rainbow of colours, and the technological structure that fiesta is associated with. Disco featured prominently, with dance moves that reflected both retro style and modern twerking. It was clearly a feast for the many dads in the audience. Acrobats performed on some floats, whilst fire-eaters wowed the audience from others. There were many different groups of stilt-walkers, some of whom were dressed as insects, others in mirrored costumes, and still more dressed as mourners. The latter group were mourning the death of the fiesta season, although the new season start is only weeks away. The final few floats were perhaps the most confusing and controversial, with a disco float decked out with dancers dressed in black and silver. Diamanté dripped from the costumes, not least from the black and bling gas masks the performers wore. This was followed by a float bearing five young maidens, whose modesty was maintained by only three large sea shells apiece. Any thoughts that they were additionally clothed was laid to rest as they turned on the float! 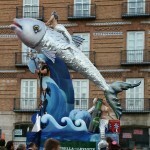 But this is a family festival, so of course, the end had to bring things back to the Spanish love of children, as four huge trucks filled with toys tail-ended the procession, toys and sweets being freely distributed. 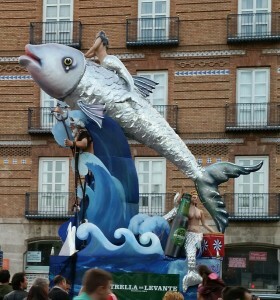 To end the fiesta, the model sardine was ceremonially burned before a massive fireworks display brought the proceedings to an end. If you have never been to a sardine festival, I can whole-heartedly recommend this one!